Ch-ch-ch-chia! The same tiny seeds that rose to stardom many years ago because of the popular Chia Pet commercials are now the latest craze among health experts. Find out why you should add them to your diet and the many ways you can eat them. 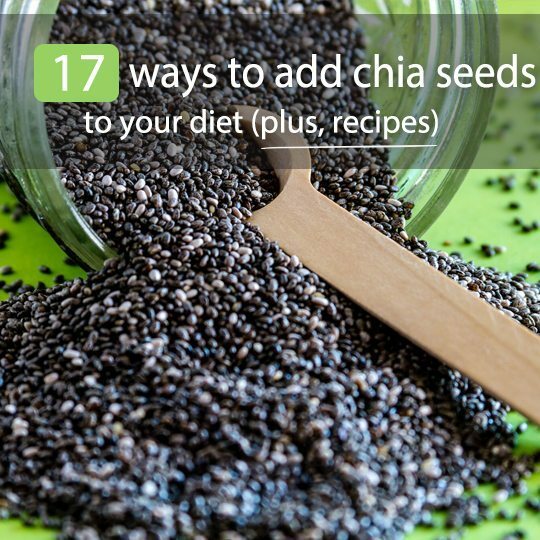 While chia seeds are tiny, they are a nutritional powerhouse. They’re rich in fiber, Omega-3 fatty acids, protein, vitamins, and minerals such as calcium, phosphorus, potassium, zinc, and magnesium. These nutrients make chia seeds extremely healthy. 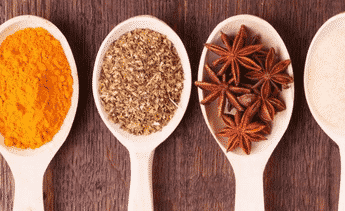 In fact, researchers say this nutrient-dense superfood can fight free radicals, boost energy, support heart health, support healthy digestion, help build muscle, and aid weight loss. Now that you know the many health benefits associated with eating chia seeds, you probably want to know how you can add them to your diet. Before we go over the many ways you can eat this superfood, it’s important to know there is a wrong way to eat them. According to a patient case study from Carolinas HealthCare System, if you don’t consume chia seeds the right way they can potentially block your esophagus. This was evidenced by one 39-year-old man who swallowed a tablespoon of dry chia seeds and then chased it with water. He experienced intense dysphagia (AKA difficulty swallowing). Doctors had to use a neonatal gastroscope to push the seeds into the patient’s stomach until his esophagus was cleared. The reason this patient had such issues is because when chia seeds are moistened, they expand to about 10 times their size. They also develop a gelatinous coating, which in this case caused an obstruction in the man’s throat. The reason I share this case study with you is not to frighten you about eating chia seeds. Rather, it’s to warn future munchers of the potential dangers and the importance of eating chia seeds the right way. With that said, eating either moistened chia seeds or ground up chia seeds is considered extremely safe and healthy. The benefit of eating wet chia seeds is that the superfood will have already developed its gelatinous coating, helping them move easily through your digestive track. As the size of the seeds expands in your tummy, you will begin to feel full. This is the main reason chia seeds are touted as a weight loss food (because they expand in your stomach, making you feel full). While chia seeds are flavorless, they can definitely transform a dish in terms of texture and nutritional value. 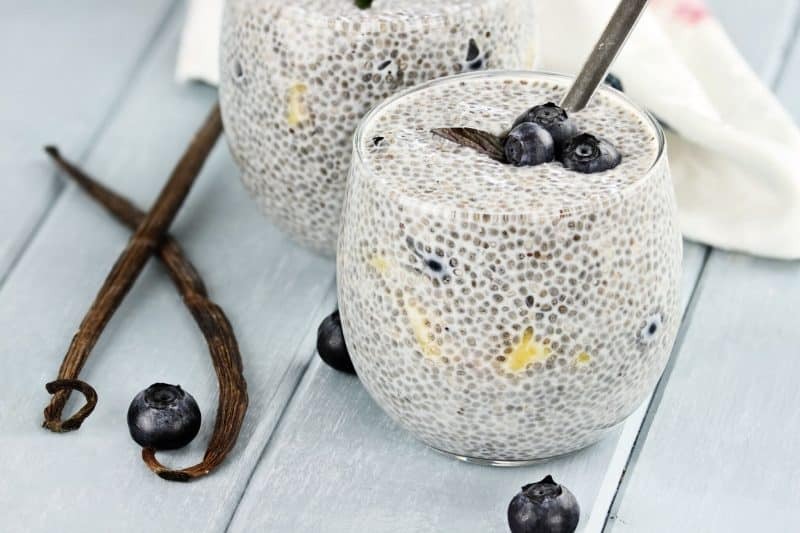 Chia seed pudding is simply chia seeds mixed with coconut milk, a natural sweetener (such as raw honey or maple syrup), and a few other flavorful ingredients/toppings. After you stir all of the ingredients together and let it set in the fridge for a few hours, you are left with a creamy, delicious, healthy, and filling meal. 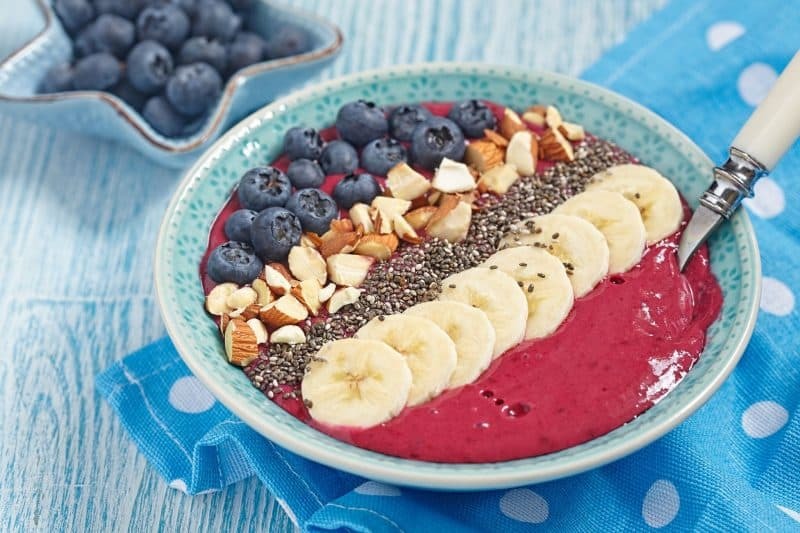 Chia seed pudding is loaded with fiber, healthy fats, and protein. It makes for a great breakfast or snack. It also fits pretty much everyone’s dietary needs since it’s gluten-free, dairy-free, and vegan. Classic Vanilla Chia Seed Pudding – This is a classic chia seed pudding recipe that uses coconut milk, vanilla extract, chia seeds, and honey. There is nothing unhealthy in this recipe and it’s great layered with fresh berries. Coconut Banana Chia Seed Pudding – Bump up the coconut flavor even more with some toasted coconut flakes! Plus, make this dish even more nutritious by slicing up and adding a few bananas. Peanut Butter Cup Chia Seed Pudding – This recipe calls for cocoa powder and peanut butter, so it truly is like eating a healthified peanut butter cup. Use these recipes as a springboard. When reading through the recipe cards, you will notice they are all similar in terms of their base ingredients/measurements and then the recipe creators just play around with add-ins. If you enjoy the taste of oranges then peel an orange and add that. If you like the taste of apples with cinnamon then dice up an organic apple, stir it into the classic chia seed pudding recipe, and then sprinkle a little cinnamon on top. It’s really that simple. *Please note: If you are going to create your own chia seed pudding flavor and want to maintain a healthy dish then be cautious about what ingredients you use. Avoid refined sugars, processed ingredients, and dairy. Instead, stick with fresh fruits and natural spices. Move over oatmeal, there is a new breakfast cereal in town! Chia cereal is similar to chia seed pudding. It involves mixing chia seeds with milk (preferably a dairy-free milk like almond milk) and a few other ingredients. Then, let the mixture sit to thicken, add some toppings, and enjoy. This recipe uses a mashed banana, vanilla extract, and some cinnamon to create a lovely morning flavor. 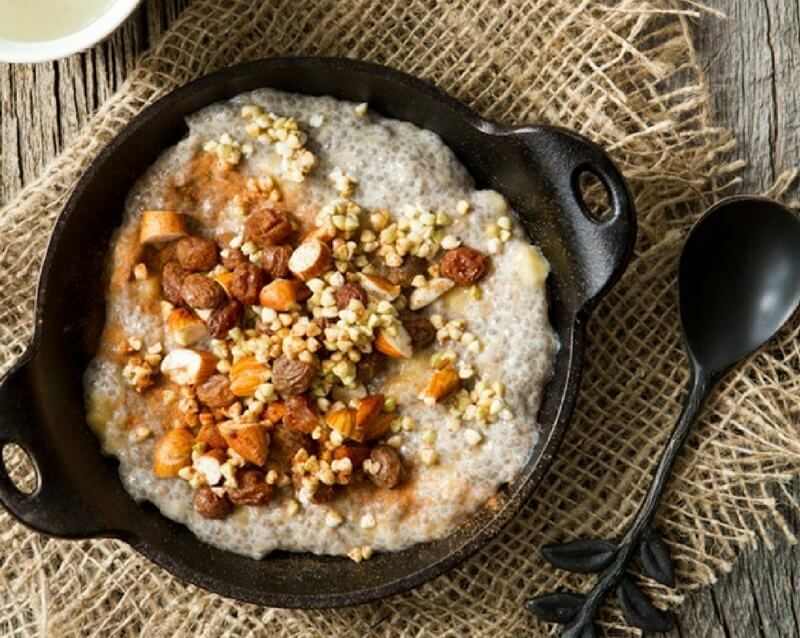 Not ready to trade in your morning oatmeal for a big bowl of chia cereal just yet? Then why not add a spoonful of chia seeds directly to your oatmeal? You can either stir the seeds into your hot oatmeal then wait a few minutes for them to absorb and swell, or you can grind them up and use the seeds as a crunchy topping. You can think of a Chia Fresca as an energy drink, except it doesn’t have all the harmful sugar and bad-for-you ingredients. Since the seeds are loaded with nutrients that have been proven to boost energy, many people whip up a bottle of Chia Fresca to take to their morning workout class. Along with boosting energy, chugging Chia Fresca during a sweat session will help keep you hydrated. Chia Fresca is made by adding chia seeds to either plain water or coconut water. Then, add either lemon or lime juice. Lastly, include a natural sweetener such as raw honey or maple syrup. Let the drink sit for about 10 minutes before taking a sip. This will allow the chia seeds to swell and become gelatinous like we talked about earlier. I’ve had a lot of people ask me about the texture and if Chia Fresca is difficult to swallow since there are a bunch of chia seeds floating around. As far as texture, the best thing I can compare it to is bubble tea. In terms of ease of drinking, it’s actually very easy to swallow since the seeds become somewhat slimy and slide down your throat. Watermelon Chia Fresca – If you like the idea of a Chia Fresca but are looking for more flavor, try adding watermelon juice to the mixture. Blackberry & Lime Chia Fresca – If watermelon isn’t in season, or you just prefer the taste of blackberries, then give this recipe a try! Are you someone who loves sipping on a delicious and refreshing fruit smoothie? Next time you whip out your blender to create one, throw some chia seeds into the mix. Adding chia seeds will simply bump up the nutritional value of your smoothie. If you aren’t going to grind your chia seeds in the blender and plan to stir them into the smoothie instead, soak your chia seeds before hand. While many people look at granola bars as a healthy grab-and-go snack, they actually made our list of 17 Foods You Think Are Healthy, But Aren’t. The problem with most protein or granola bars is they’re highly processed, high-calorie, loaded with sugar, and contain high fructose corn syrup. The best thing you can do is make homemade bars so you can control what ingredients go into them. A side bonus — you’ll get to add chia seeds! Quinoa Chia Seed Protein Bars – It doesn’t get much healthier than this. These bars are loaded with protein thanks to the quinoa, chia seeds, oats, nuts, and almond butter. As a result of the high protein amount, these bars are extremely filling. So if you eat one for breakfast, your stomach should feel satisfied until lunch time. 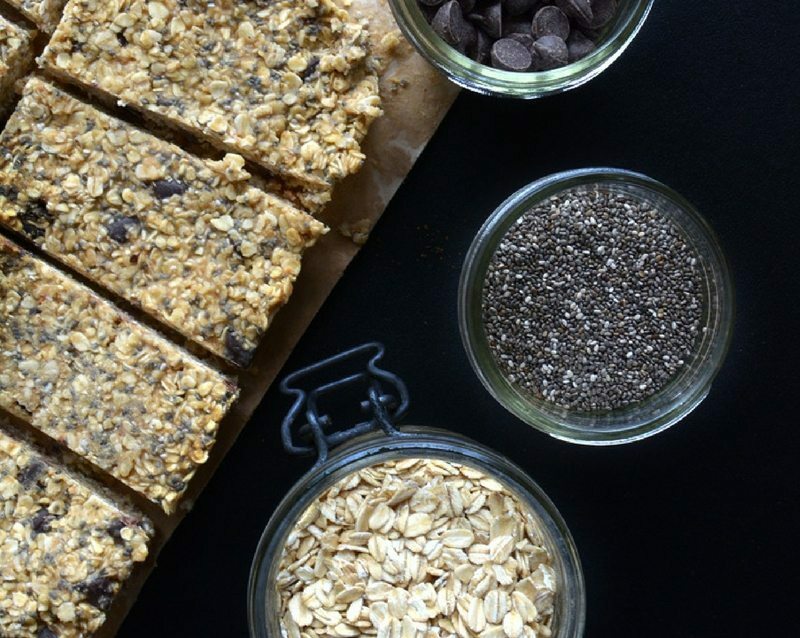 Chocolate Chip Chia Seed Granola Bars – These bars are both delicious and nutritious. They call for oats, peanut butter, coconut oil, maple syrup, chocolate, and chia seeds. Thanks to those amazing ingredients, these bars are loaded with fiber, healthy fats, protein, vitamins, and minerals. When choosing which chocolate to include in these bars, use a dark chocolate that’s at least 70 percent cacao. The darker the chocolate, and the higher the cacao content, the healthier it is. As I mentioned earlier, chia seeds help give the body a natural energy boost. So it makes sense to add chia seeds to energy bites! In case you aren’t familiar with energy bites, they are small, highly-nutritional balls that you can munch on when you’re hit with the afternoon slump. You can also munch on energy bites before a workout to give you a quick energy jolt. 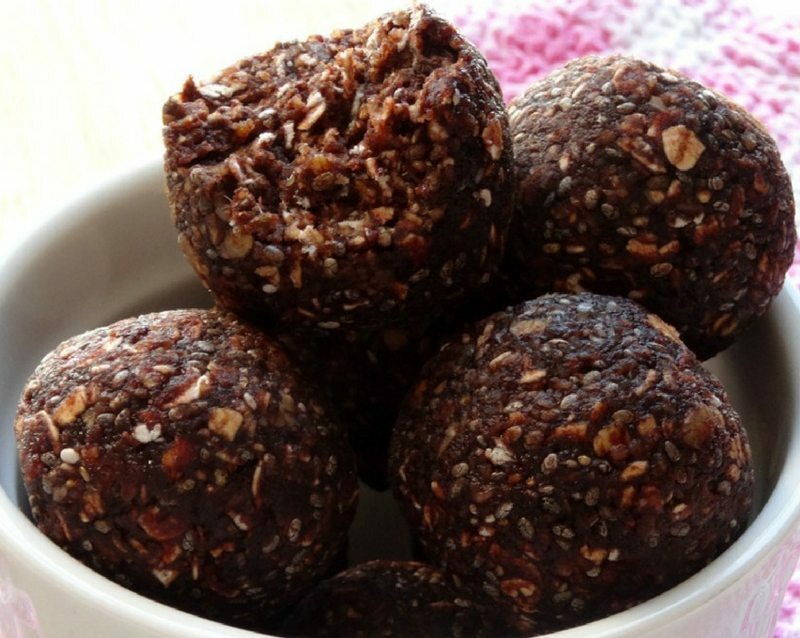 Here is a recipe for no-bake chocolate chia seed energy balls. All you have to do is add the ingredients to a food processor, shape them into balls, and enjoy. Even the healthiest of eaters get hit with food cravings from time to time. What can I say, sometimes we just need to cave in and satisfy our hormones when they call. Feeding your cravings doesn’t have to mean ditching your healthy eating habits, though. Next time you feel a major snack attack coming on, ignore the processed chips and reach for some homemade chia seed crackers instead. Ultimate Seed Crackers – This recipe calls for four different types of seeds, a little salt, and water. Dip these crackers in hummus or another healthy dip for extra flavor. Endurance Crackers – While this recipe is similar to the last one, it also calls for garlic. Since garlic is one of the healthiest foods on the planet (not to mention it’s delicious), these crackers are definitely a must-try! While you shouldn’t eat baked goods every day, there is a place for them in a healthy diet. You just need to know how to healthify your recipes. For example, use gluten-free flours versus bleached all-purpose flour, opt for natural sweeteners over refined sugar, swap out vegetable oil for healthy oils, and toss in a spoonful of chia seeds for extra nutrients. Just add the chia seeds to your batter and bake as normal. Raspberry and Vanilla Chia Seed Jam – This recipe does call for a bit of honey to add even more sweetness. 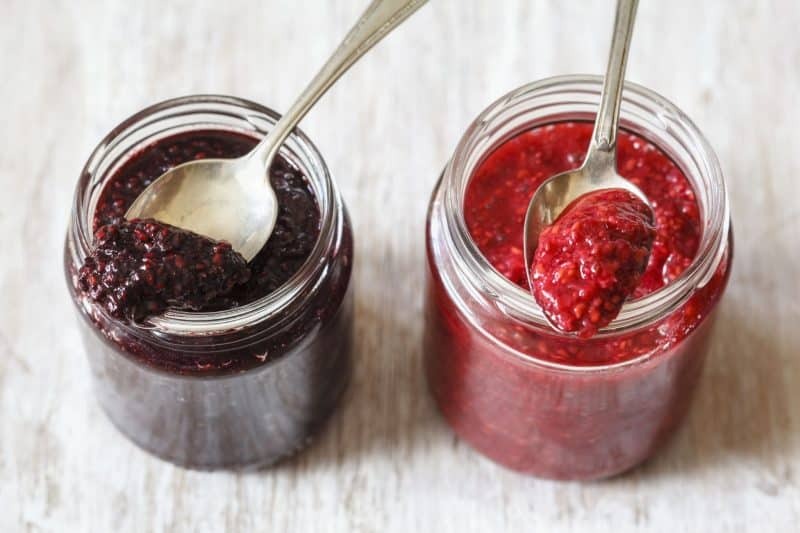 Strawberry Chia Seed Jam – Along with the chia seeds and strawberries, this recipe calls for raw maple syrup to add a touch of sweetness. You will notice this ingredient is optional. I recommend taste testing before you add the maple syrup. If you like it as is then leave it out! Even though maple syrup is a better option than refined sugar, remember, it’s still sugar. As we learn more about the importance of reading ingredient labels, we are discovering how unhealthy a lot of our everyday food is … like salad dressing. It’s normal to view salad as a healthy meal, but once we pour our store-bought dressing on top of it we have transformed our bowl of nourishing greens into a dish filled with sugar and unhealthy food additives. 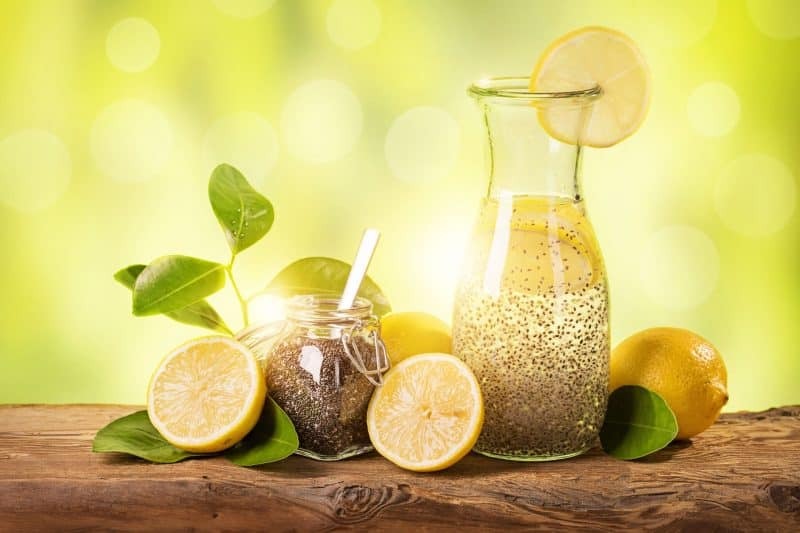 Lemon Chia Seed Salad Dressing – Chances are you already have all of the ingredients you need for this recipe right in your kitchen. A little olive oil, vinegar, a lemon, honey, chia seeds, salt, and pepper. That’s it! Plus, you don’t need any fancy kitchen gadgets to whip this dressing together. All you need is a bowl and an old-fashioned whisk! Lemon Blueberry Chia Seed Vinaigrette – If you are into sweeter salad dressings then this recipe is perfect for you. It will satisfy your sweet tooth and your skinny jeans at the same time (since it doesn’t call for any refined sugar). At this point, you can clearly see how versatile chia seeds are. You can even add them to your favorite homemade or store-bought dips to enhance the nutritional value. Just grind the chia seeds up in a food processor before mixing them into your dip of choice. Often times, recipes call for flour as a way to thicken soups and stews. 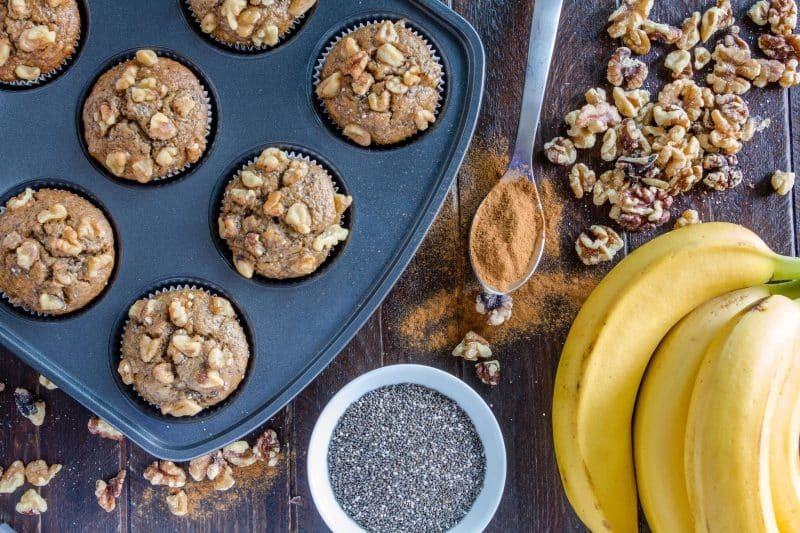 Rather than using gluten-laden flour, why not use some chia seeds? 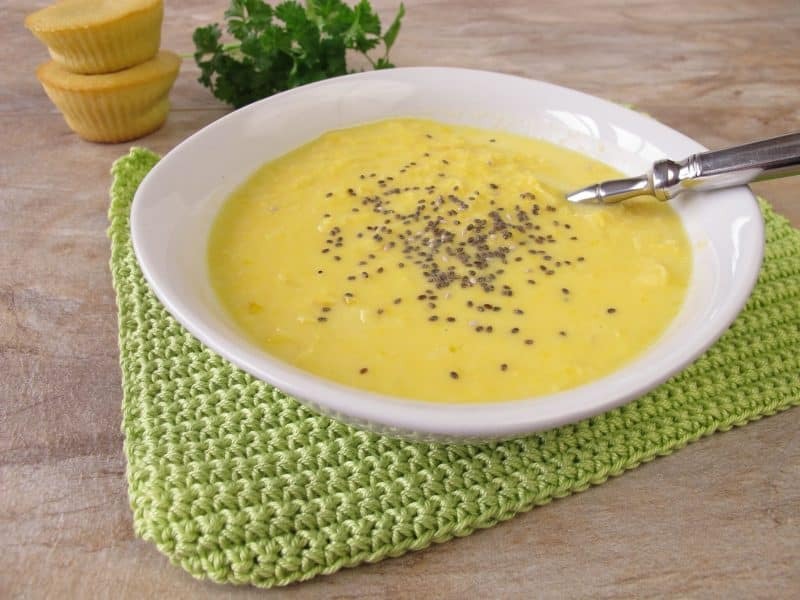 Simply pre-soak chia seeds until they form into small gel-like balls and then add the seeds to your soup recipe. You will notice the texture of your soup/stew will thicken immediately. If you avoid eggs in your diet because you are allergic to them or they don’t fit into your dietary requirements then baking anything from pancakes to birthday cakes can be difficult. Most baked goods call for eggs because they add moistness to a dish, act as a binding agent, and help with leavening. While eggs play an important role in baking, they can be substituted for chia seeds. As a general rule of thumb, 1 egg is equivalent to soaking 1 tablespoon of chia seeds in 3 tablespoons of water. Most burger and meatball recipes call for either eggs or breadcrumbs to help thicken and bind all of the ingredients together. If you are using chia seeds as an egg replacement, follow the ratios mentioned in number 14. If you are replacing breadcrumbs, try using 2 tablespoons of ground chia seeds for every pound of meat you use. Remember – you can always add more seeds, but once you mix them with the meat you can’t take any away. So it’s always better to start with less and then add more as needed. Speaking of replacing breadcrumbs, if you enjoy a crispy coating on the outside of your fish or meat dishes then experiment with ground up chia seeds. They make for a great coating! While you want to avoid eating spoonfuls of raw chia seeds (for the reason I mentioned in the beginning of this article), you can use ground up chia seeds as a topping on various foods. Sprinkle them on top of smoothie bowls, Greek yogurt, pudding, or your morning bowl of oatmeal. You can also sprinkle them on top of a salad to enhance the nutritional value and offer a nice crunch.